Whether your natural eye colour is dark or light, brown contact lenses are a fabulous way to update your style and light up your whole look. 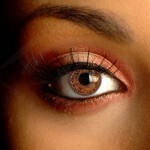 Brown colour contacts are very flattering and can really transform your look. If you have blue or green eyes, a pair of brown contacts will add warmth and drama to your features. If you already have brown or black eyes, you can use brown contact lenses to intensify your eyes or add a little extra glamour to your look. There are hundreds of different brown contact lenses available online, but below are two of the most popular varieties. These natural brown contact lenses are specially designed to look convincing, but with added drama and depth. When selecting natural brown contact lenses, it is important to find a design that compliments your natural colouring and skin tone. The Glimmer and Mystic lenses below both have a clear background, which means that they can blend in with your natural eye colour. These lenses look very natural on green, hazel or grey eyes, but less so on blue eyes. The 3-Tone Brown Contact Lenses, on the other hand, cover your natural eye colour completely and will look gorgeous regardless of your natural colour. 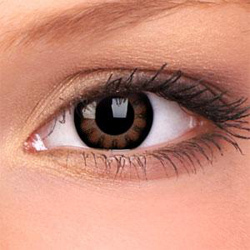 Another popular variety of brown contacts are brown circle lenses, a lovely example of which you can see here. These contacts feature a dramatic black outer ring that makes them really stand out. They are inspired by the wide-eyed look of anime characters and give your eyes a truly unique look. These brown circle lenses give a sweet but soulful look and make your eyes look bigger.